Making bread at home, be it leavened or unleavened is a rather rewarding experience. The process is no doubt messy with flour splattered all over the kitchen and your clothes (and sometimes on your face) but I find it calming and in a way relaxing. 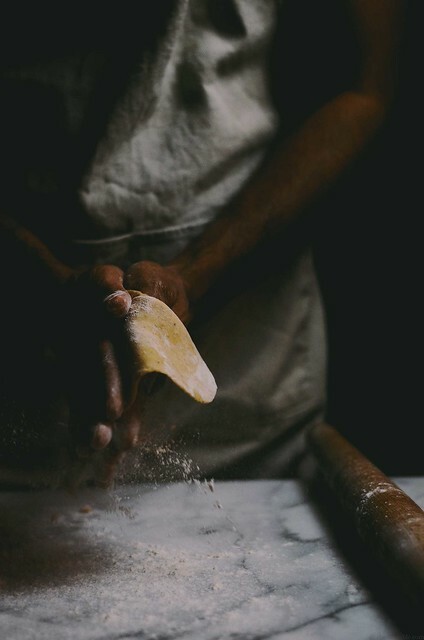 You get to knead your energy into the dough, sometimes you get to punch it to release the trapped air from fermentation, you might get to massage out your thoughts with a rolling pin and at times you even get to slap it. In short, bread making is therapeutic and fun! This bread is all about flatbread and one of my favorites because you it's pretty much a whole meal in itself, served with a little plain unsweetened yogurt on the side and you're good to go. I think of chickpea flour or "besan" (in Hindi) as the other flour, the one that comes after wheat and rice in Indian cooking. 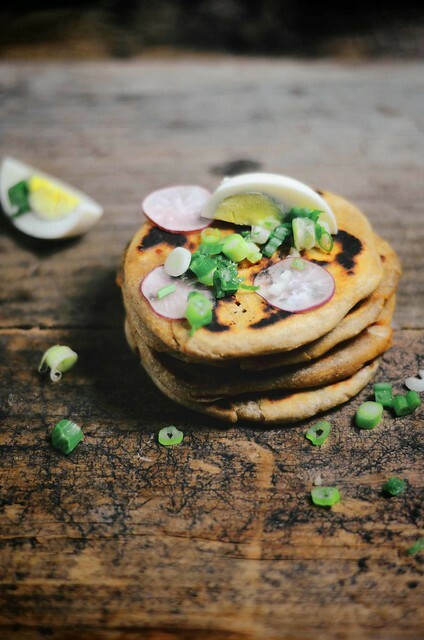 I strayed away from the traditional method of preparing these as a roti (another type of flatbread) and instead made it flakier by trapping fat between layers of the dough. 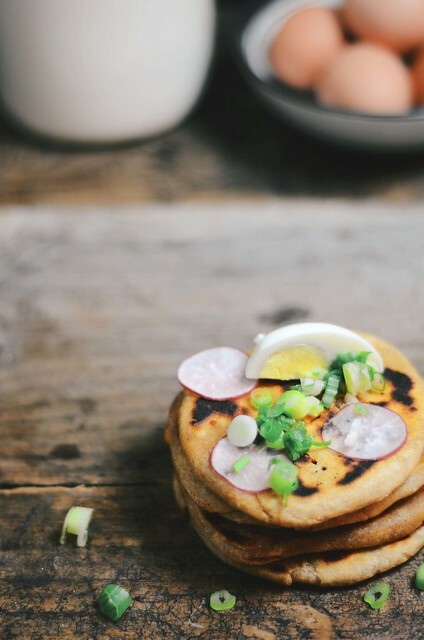 If you're looking to venture out and try a new type of flatbread, this is a great one to begin with. .......And I like to drizzle this bread with a little melted ghee or butter. This is not a gluten-free bread. The gluten from the wheat helps to create a softer bread. The dairy ingredients help to provide fat and protein to make the bread even softer. Sift your chickpea flour, I've found some brands to be grainier than others. Avoid rolling out the bread too thin or it will be come very crispy. If you can't find durum wheat flour, try the 50-50 mix of whole wheat to all purpose flour option I've listed in the ingredients below. It mimics the durum flour softness rather well. 1. If mixing by hand: Place all the dry ingredients from the chickpea flour to the red chili flakes in a large mixing bowl. Make a well in the center. Then pour the oil, milk, yogurt in the center of the well. 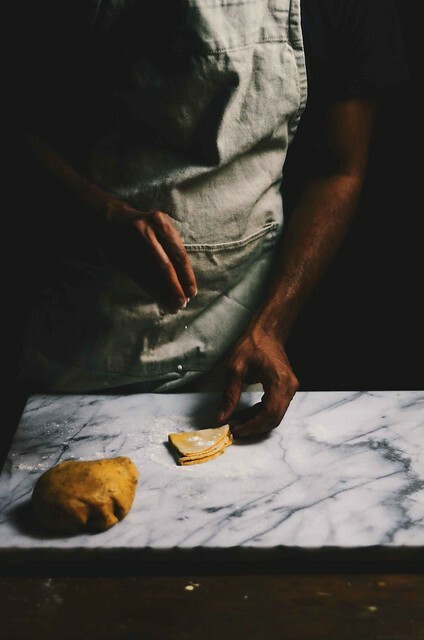 Begin to mix the ingredients together with your hands to form the dough. Slowly add a little water to the dough to bring the dough together, you may need a little more or a little less depending on the humidity and how dry the flours are. 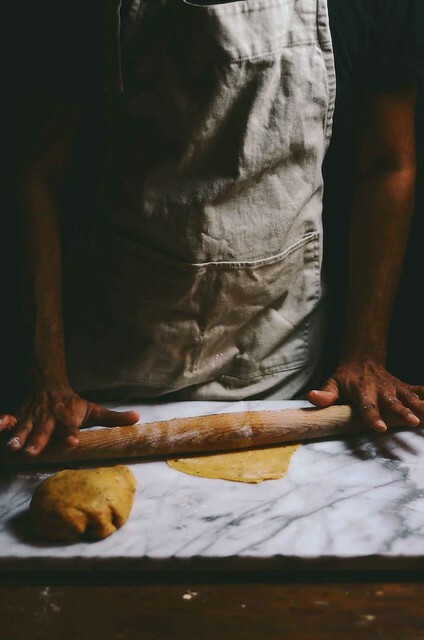 As soon as the dough comes together and there are no visible flecks of flour, form it into one large ball, wrap with cling film and allow to rest for at least 1 hour before using . If using a Food processor: Attach the dough blade in the food processor. Place all the dry ingredients and pulse a few times to mix. Then add the all the liquid ingredients from the oil to the yogurt. Begin to pulse the ingredients to mix and slowly trickle the water into the mixture while the processor is running (you might need a little more or a little less). As soon as the dough comes together and no dry flecks of flour are visible. Remove the dough from the bowl of the food processor and form it one large ball on a clean lightly floured surface and wrap it with cling film. Allow to rest for at least 1 hour before rolling. 2. Divide the dough into 10 equal sized balls. Take one ball at a time to prepare the parathas. 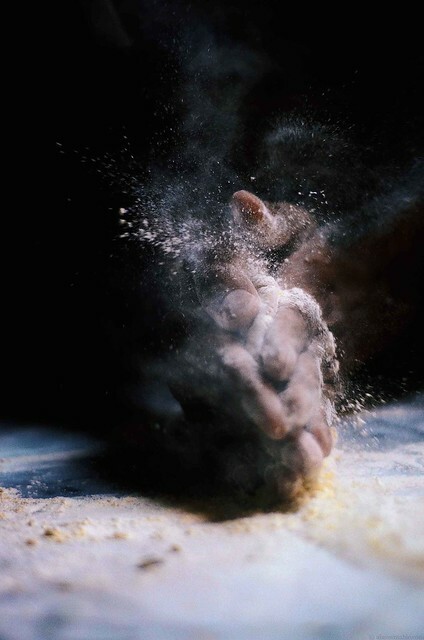 Dust a ball with a little flour and then roll it out using light pressure into a small circle about 5 inches in diameter with a rolling pin. Spread/brush with a tiny amount of oil on the upper surface of the rolled out dough. Fold it into a semicircle and brush the upper surface with a tiny amount of oil and fold it over itself to form a triangle. 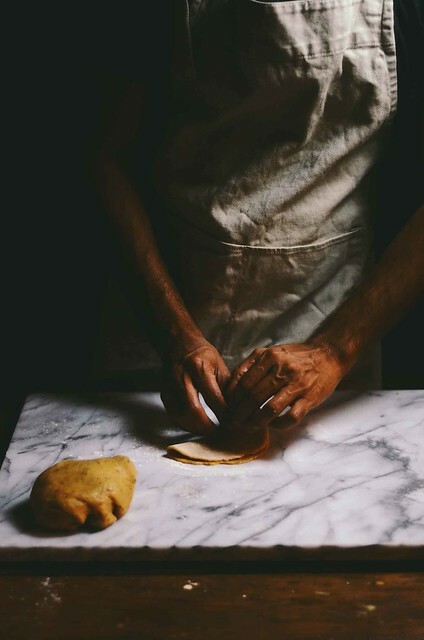 Dust each side with very little flour on both sides and roll it out using light pressure out on a clean lightly dusted surface to form a triangle/tear drop shaped bread. It helps to rotate the dough by 90 degrees between every roll. Prepare the rest of the parathas in the same manner and keep the aside until ready to cook. 3. Heat a skillet on medium-low heat. Add one teaspoon of oil, gently dust off any excess flour from one rolled out paratha and place it on the hot pan. Allow to cook until you start to see tiny blisters form on the lower side (about 1 minute). Press the ends of the bread down with a damp clean kitchen towel or a silicone spatula to ensure the bread cooks evenly. Spread a tiny amount of oil on the surface of the bread and flip it over and cook in the same manner. Transfer the hot bread and keep them sandwiched between two clean kitchen towels. 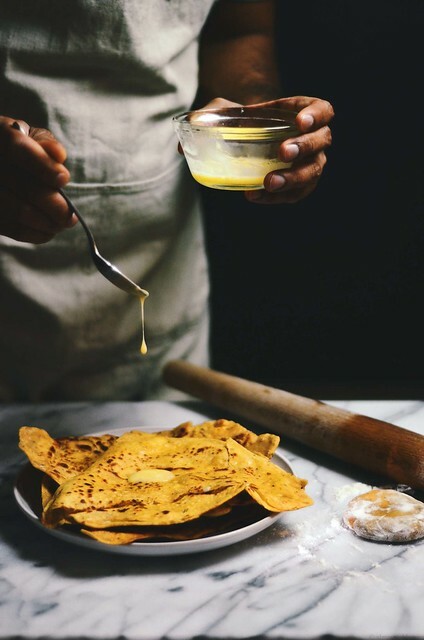 Cook the rest of the parathas and serve them hot/warm and drizzle with a little melted ghee or butter. There are mini cakes and now, there are mini parathas, I don't see why not! 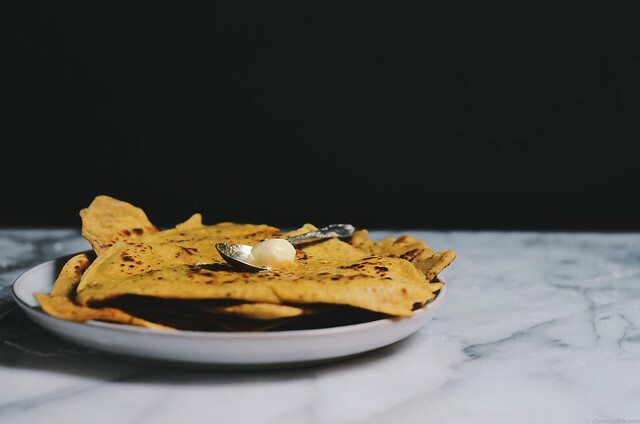 If you haven't tried a paratha, here's the gist, it's a flaky flatbread made with whole wheat flour that can be stuffed with tasty things or not. 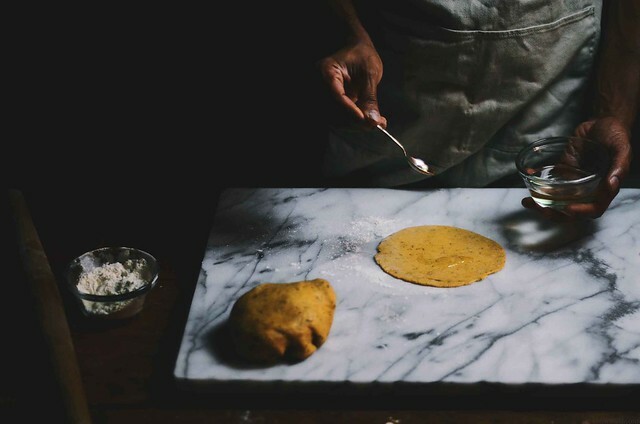 Contrary to popular belief, it's rare to see naans being cooked in an Indian kitchen but you'll definitely see parathas being cooked a lot (and rotis too). 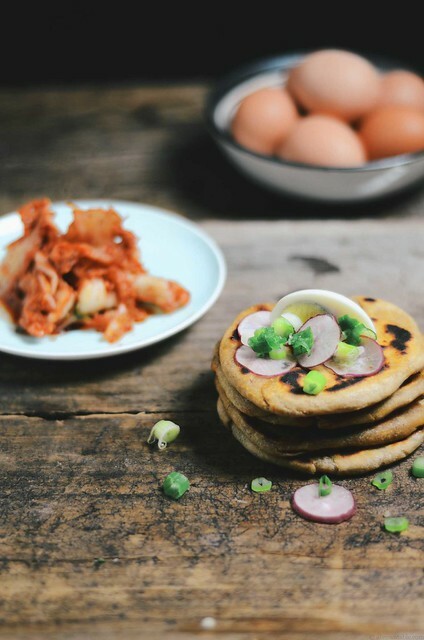 You can eat parathas at breakfast, lunch, or dinner (it works for every meal) and this kimchi-stuffed paratha does just that! We live in a part of the city that is considered Koreatown, lots of Korean grocery stores and restaurants but it also plays host to quite a few Indian restaurants. 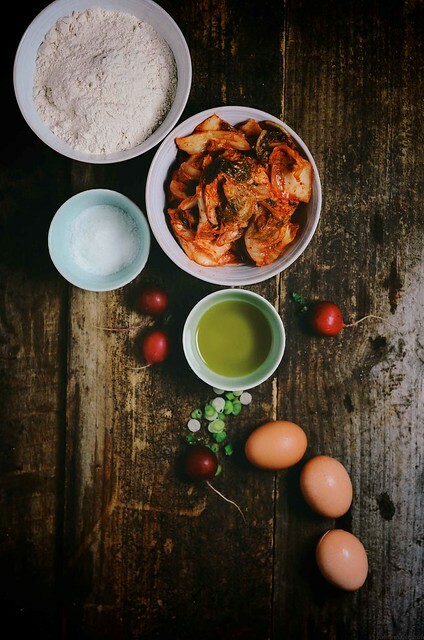 The exciting part about living in a predominantly Asian neighborhood, I get to try and buy a lot of different types of kimchi from the markets, the one I used in this recipe is a Napa Cabbage type but you can use any of your favorites. Use durum whole wheat flour, it gives the best texture and a softer bread than you would with regular whole wheat flour. It is also sold as "atta flour" in Indian grocery stores. Drain the kimchi to remove some of the liquid, it makes it easier and less messy when you stuff the flatbread. Greasing your hands before assembling the parathas, makes it easy to flatten the discs. You could also flatten the discs of dough with a rolling pin but they can burst and the cabbage releases a lot of juice and I found that technique to be more of a headache for this type of a filling. The dough would rip under pressure from the rolling pin and it is not easy to pan fry flatbread with stuffing falling out. 1. Place the kimchi in a large strainer or sieve over a bowl. Press gently to drain the excess liquid. Chop the kimchi coarsely and keep aside. 2. In the bowl of a stand mixer, place the 3 cups of whole wheat flour and salt. Whisk a few times by hand to mix the ingredients evenly. Add 4 tablespoons of the vegetable oil and 1 cup of the warm water. Using the dough blade attachment, combine the ingredients on low speed for about 4 minutes to form the dough. 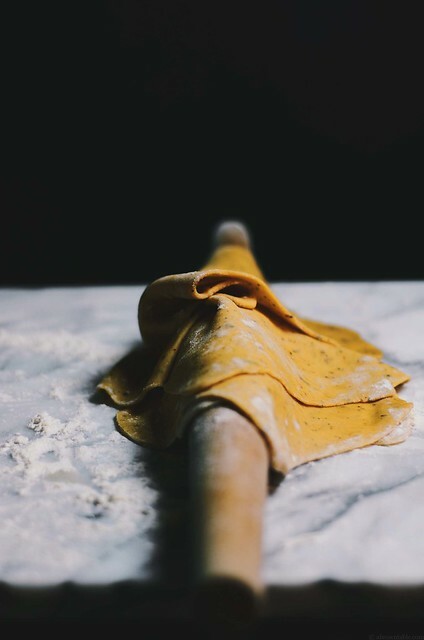 If you feel that the dough is not coming together easily add one tablespoon of the remaining hot water, one tablespoon at a time, until the dough comes together. Wrap the dough with cling film allow to rest for about 20 minutes before using. 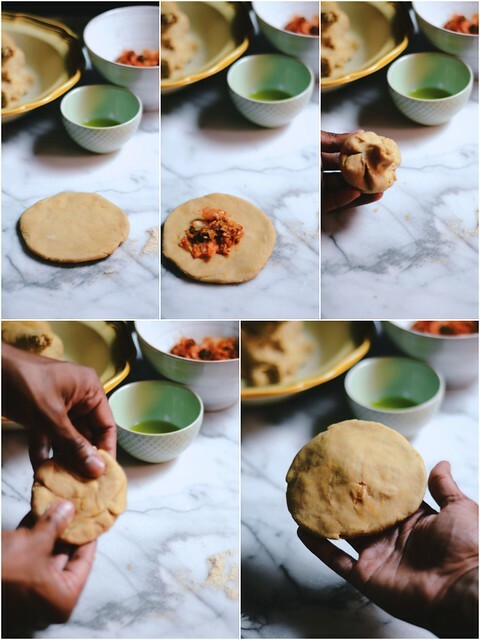 (You can also prepare the dough a day in advance and refrigerate the dough until ready to use, just bring to room temperature before preparing the parathas). 3. Divide the dough into approximately 12-14 one inch diameter balls. Dust the balls with a little extra flour and keep the balls covered with a clean moist cloth to prevent drying. 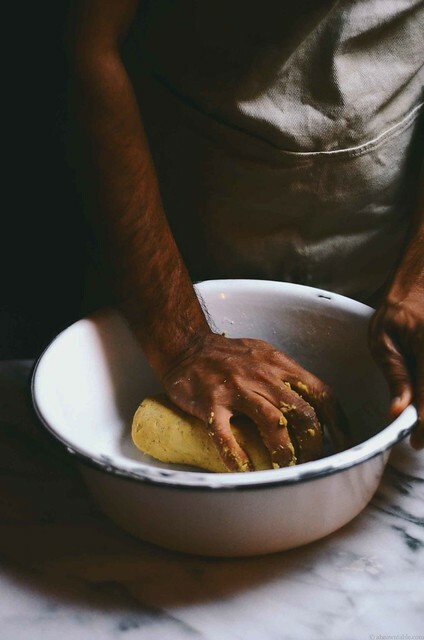 Before preparing the parathas, grease your palms a little with the oil. Take one ball in the palm of your hands and flatten to form a disc that is about 5 inches wide. Place about a generous teaspoon of the chopped kimchi in the center and bring the edges and seal the top (this is similar to making a dumpling). Flatten the top with your hands and using your fingers flatten to form a disc that is about 6 inches wide. While flattening the disc try to push the filling in the center towards to the side. Prepare the rest of the parathas similarly. (The photograph panel above, has step-by-step figures). 4. Heat a non-stick or cast iron skillet on medium high. Put about 1/2 a teaspoon of vegetable oil in the center of the hot pan and add one paratha in the center. Cook on each side for about 2 minutes until each side is lightly blistered and seared. PlaceCook the rest of the parathas similarly. 5. 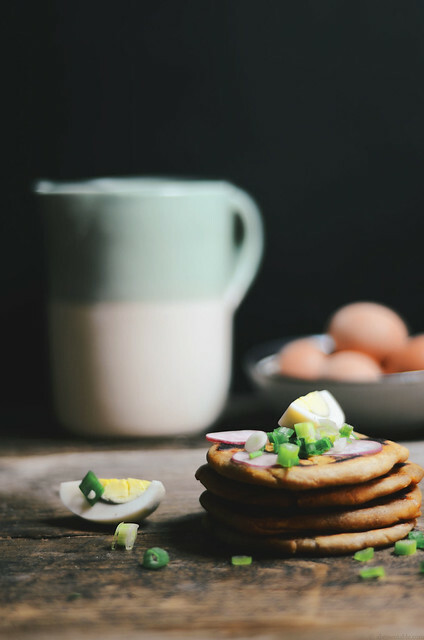 Serve the parathas with quartered boiled egg slices garnished with a few scallion and radish slices along with a little kimchi on the side. Season with salt and pepper as needed.